1What is the EDI? https://edi.offordcentre.com/researchers/how-to-interpret-edi-results/-accessed July 31, 2017. 2 Janus, M. & Duku, E. (2007). The school entry gap: Socioeconomic, family, and health factors associated with children’s school readiness to learn. Early Education and Development, 18(3), 375-403. https://edi.offordcentre.com/wp/wp-content/uploads/2015/10/Janus-Offord-2007.pdf-accessed July 31, 2017. 3EDI BC 2016 Provincial Report. http://www.edibc2016.ca -accessed July 31, 2017. The EDI and an early years video was created by the team at the Offord Centre for Child Studies, McMaster University with the help of ThinkLink Graphics. 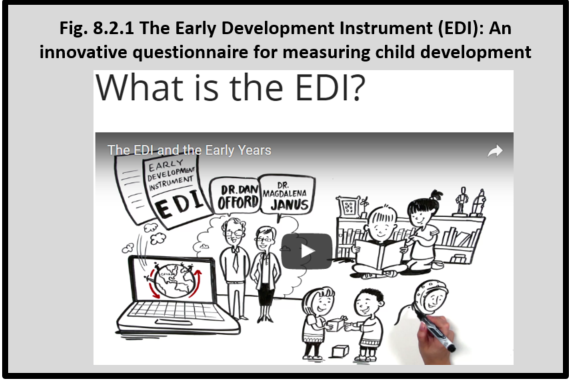 To find out more about the Early Development Instrument (EDI) or to view the video (available in English and with French subtitles) please click here. The Communication Skills and General Knowledge domain includes skills to communicate needs and wants in socially appropriate ways, symbolic use of language, storytelling, and age-appropriate knowledge about the life and world around the child. The Emotional Maturity domain includes the ability to think before acting, a balance between being too fearful and too impulsive, an ability to deal with feelings at the age-appropriate level, and empathetic responses to other people’s feelings. The Physical Health and Well-being domain includes gross and fine motor skills (e.g., holding a pencil, running on the playground, motor coordination), adequate energy levels for classroom activities, independence in looking after own needs, and daily living skills.